Ashley Simpson’s 34th birthday was honoured not with celebration but with ceremony and a call to action. Leading that call was Jody Leon, who organized a gathering Thursday evening – the day after Simpson’s birthday – at a bridge in the south end of the Yankee Flats area – where Simpson had resided before her disappearance. “We were not able to come out on yesterday’s date… Nevertheless, it’s still very important that we’re here to honour all the women that went missing in this area,” said Leon to an intimate crowd of supporters, including Simpson’s aunt, Marney Portugaise, as well as Dennis and Jane Aubertin, the parents of Malakwa resident Nicole Bell who was last seen in Sicamous on Sept. 2. “We want to keep their memory alive. We want to say gone but not forgotten. These women are important, and it’s important to keep their stories in the spotlight until we have resolution on every last sister that is missing. 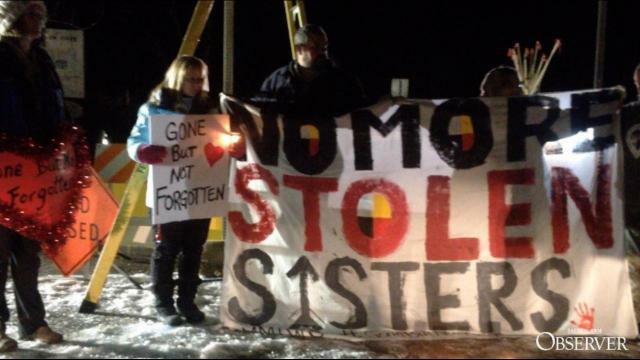 During the ceremony, Portugaise and the Aubertins held up a banner saying, No More Stolen Sisters. A second, smaller banner next to it said, Ashleys Army… Never Give Up, naming the four local missing women as well as Genereaux. Leon and Portugaise encouraged anyone with information related to the missing women to come forward. After the ceremony at the bridge, the caravan left for Salmon Arm to go door-to-door in the 10th Street SW area as police did on Oct. 30, canvassing residents in their search for Bell. Leon said the families of the missing women have been grateful for the support she and others have provided, for bringing them together and helping to give them a voice. The next step for Leon and company is a drone-assisted search being conducted this Saturday, Nov. 18.